Chromebooks……Now there is a word that you either love or hate, and for the past few weeks, I have tried to get my head around the pros and cons of Google’s venture in to the personal computer market. Regardless of what Microsoft or Google might want you to think, the device does have some good points as well as some not so good, but we will get to that later. 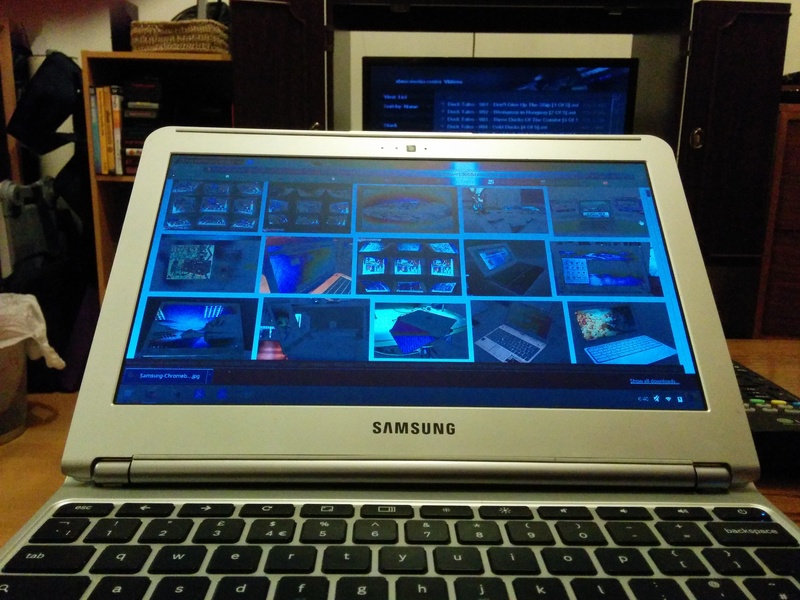 Thanks to a friend loaning me his Samsung Chromebook, I’ve tried to form an opinion from a consumer’s view point. The Samsung 303C Chromebook looks the business with a nice silver finish and a matt black keyboard embedded into the case. The plastic feels reasonably sturdy considering how light the device is in general. Almost all the ports are located at the rear of the device, aside from an SD card slot and headphone jack. It is understandable why, as the device is so thin the rear is the only part thick enough for the usb ports to be installed. The results are some awkward fiddling when you’re wanting to swap between usb devices. Surprisingly Samsung opted out of using an IPS screen on the series 3, instead choosing a cheaper, more common, low resolution TN 1366 panel. Likely a move to keep the device affordable, which an IPS panel would not have done. 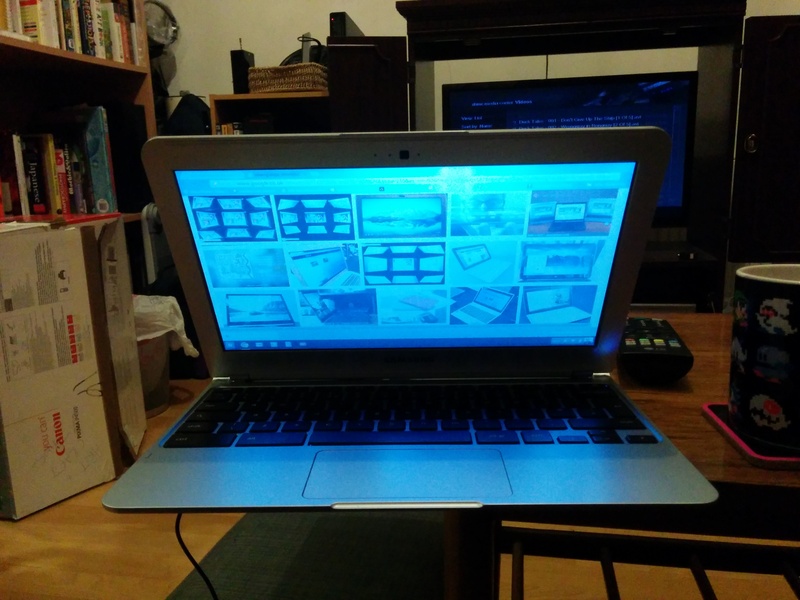 Using the Chromebook I found the viewing angles to be annoying and the colour quality poor, blacks appearing slightly grey and other colours generally washed out. Turning up the brightness only worsen the effect and after a few hours typing, I began to develop eye strain. This might have been ok in 2005 but in this age of high def video and IPS screens. I have to confess the screen was my main niggle about the device. With the screen angled away from the camera, things become slightly illegible. The unique trackpad finger gestures took me some times to adjust to, but after a day or two i found them very handy. Especially the two finger tap, this is a feature i could easily get used to. I’d recommend familiarizing yourself with all the gestures to get the most of of using the ChromeOS. The keyboard is reasonable, I found myself instantly at odds with the absent caps lock key, which has been replaced with a search button. Fortunately you can reassign the button back to acting as caps lock. A friend was surprised I actually missed it, did i really still use it while typing? Apparently yes, more than I had realised, so when it was gone my typing feng shui was totally out of whack. Every application you use on the ChromeOS is run via the web browser, be it a word processor, paint package or game. I have to say I was dubious how good this would be and was surprised to find it worked pretty well. Google Docs runs really well and for blogging I would say makes an excellent word processor. This entire article has been written using the Samsung Series 3 in an effort to test how good it was for writing. While it won’t be replacing my iBook G4 anytime soon, I can honestly say it has not been a bad experience. Google Docs and Spreadsheet applications will suit your average user, but if you’re used to macros and the more advance features of applications such as Office, you will probably find it severely restrictive. Gaming on the other hand was a hit and miss experience, but I never really expected it to be Call Of Duty. The vast majority of games I tried to play, redirected me to websites offering all manner of jewel, crystal, bubble puzzle games with one or two genuine retro arcade offerings, such as Pacman or Mario. This would have been fine were it not for all the adverts, like most websites they are filled with inline advertisement and popups. some of which are targeted advertisements sourced from my google browsing habits. Which feels uncomfortably big brother to me. This is also one thing which is worth touching on, the apps in the app store really should be apps. The biggest failing i found for the ChromeOS was that the vast majority of the apps I installed, were simply web pages and not Chromebook specific applications. Most of the time these links would lead to a web page informing me that i did not have the right plugin installed, the most common of which being the Unity plugin. When I saw “Iron Man” in the apps store I got excited, believing I would be flying around as Tony Stark. What a disappointment when it turned out to be yet another link to a unsupported Unity game. While Google has provided users with its main staple applications such as Maps, Calendar, Docs, Spreadsheet, Play Music. There is room for improvement if Google wishes to impress the average user. Plenty of websites I visited over the past few weeks made comparisons between the Samsung Series 3 and the Apple Macbook. In my opinion this is a bad comparison and sets peoples expectations of the device on a bad footing. So we are clear, a Chromebook IS NOT A MACBOOK nor does it perform like one. 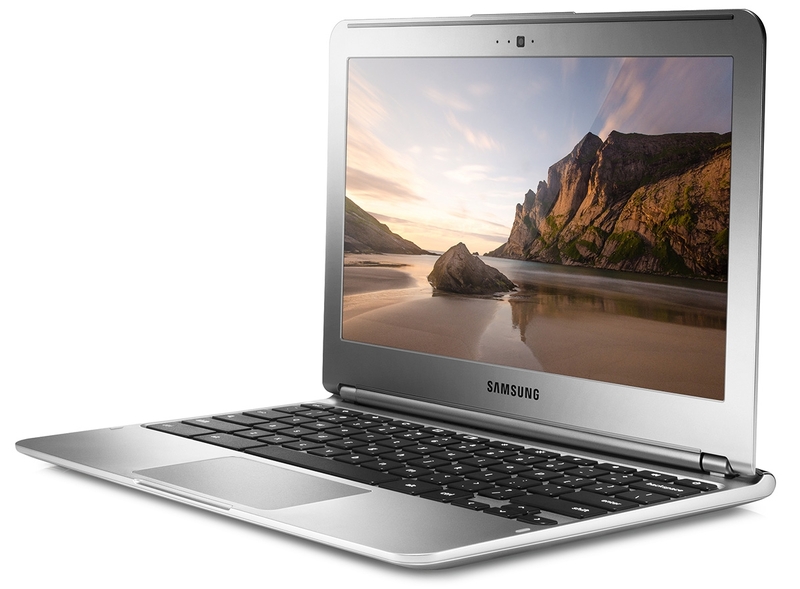 For a sub £200 netbook the Samsung Series 3 offers plenty to people who spend a lot of time surfing, working or socialising on the internet. The best way to imagine a Chromebook, is to think of it like a tablet with a keyboard. Now I want you to remember that tablet with keyboard analogy because it will crop up later. Sending a file from my chromebook to someone elses computer in the same room. Printing with a Chromebook can be done, however it requires that your printer is new enough to have Google Cloud Print or that you have Chrome installed on your main PC. Using Chrome (on your desktop PC) you then set up a share your printer and chrome, so that your chromebook can access it through your main computer via your network. Needing this second computer is not exactly friendly on your electricity bill, but it gets the job done. You sadly you can’t plug the printer in to the USB port and print directly like a normal computer, this literally is a “net” book. The device depends on your having a wireless network, otherwise it becomes a pretty useless device. I appreciate why some websites might feel inclined to write pro google reviews, but lets not get delusions of grandeur. A Chromebook is not a desktop replacement, not to the general home consumer at least. Sadly because you are restricted to working through a browser, the Chromebook does not support SMB or UPNP shares without third party software. Even if you can access shared networked storage, the Chromebook does not have the ability to play MP3 or Divx files through any sort of file browser. Whether Google will address this issue is anyone’s guess, as the device is aimed at the internet, it is probably unlikely that network sharing with Windows or Apple devices is at the top of their list. For now the only way I found to exchange files with someone was via Dropbox, Google drive or email. Ok, that is how Google wants people to handle their data, however if you’re in a room with a friend and trying to exchange photo’s from last nights party. Having to upload and download the data seems time consuming, not to mention a pain if you have a limited data allowance on your broadband connection. The only way around this is using a USB pen or SD memory card. Markets that might find the Chromebook appealing are the education and corporate sectors. Chromebooks offer cloud storage and data backup, a sandbox environment that prevents malware and viruses reaching the system, no OS license fees and low cost. Because the ChromeOS runs applications via a web browser, applications can be written and run through the browser without needing to be install on each and every computer in an office block. In schools, teachers could write up lesson material for students to access easily via a web page. It is easy to see how such a device would be appealing to organisation looking for low cost computers that require a minimal amount of work to setup. In addition any company that is tired of renewing their anti virus software or keeping on top of operating system updates, may find Chromebooks a cheap and appealing alternative to Microsoft Windows and Norton Antivirus. Damage your Chromebook and you can replace the device, log in and all of your files will be there, provided you have stored them online. Chromebook sales are on the up, but will it become the sell out that Android was for the tablet market? Your guess is as good as mine. The devices are quick, secure and reasonably cheap but really they don’t offer much more than that. Google intention is for the Chromebook to be that third device in the house. While it does not replace the main computer, it offers a little more than a tablet when it comes to writing up that essay for school, blogging about your holiday or updating everyone on Facebook about what you had for dinner. This wouldn’t be ByteMyVdu if I did not point out that all of these things could just as easily be achieved on an old laptop bought from ebay or Craigslist. Even working within a budget of £20 to £80, you could pick up an old Windows or Apple laptop. An example would be the G4 iBook 1.33Ghz which I use to write articles for this blog, I certainly find the screen easier on the eyes. Out of all the articles I have read while trying to research these devices and drawing on my own experience this past week. There was one article by Melissa Riofrio that I truly agree with, who hit upon something which totally clicked. Who would I give a Chromebook to? Most likely someone to whom computers are a mystery, the sort of friends who constantly fill their hard drives with apps that promise to optimise their computer or protect against spyware, while doing the exact opposite. People who want the ease of a tablet with the functionality of a laptop computer with a keyboard and mouse for email and surfing. See didn’t I tell you the tablet and keyboard analogy would crop up again? The ChromeOS may not suit us techies, but to the not so tech savvy it offers a real alternative to a full blown computer. Especially if all you are wanting is something for surfing the internet, send emails or order that Friday night takeaway. Dear readers, as some of you will be aware, I’m something of an avid fan of old Apple Macintosh Computers. 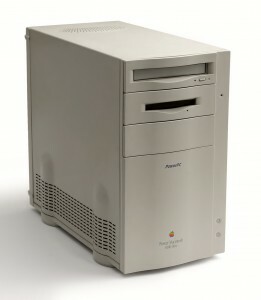 My first Apple computer was non other then the might Power Macintosh 8500. A technical power house of it’s day, offering impressive video editing features. Over the past 2 years, I have on and off been trying to bring back my 8500 from the dead, after it decided one day not to boot. I’ve bought parts, ram, CPU’s and still nothing would bring it back to life. Imagine my joy when today I finally got it to BOOT UP! Has the old Apple “Boing” ever sounded so sweet! That is all for now, as i return back to working on this beloved computer and getting it back in full working condition! Just a quick update to tell you about the exciting things coming soon to ByteMyVdu. In the next month I shall be covering connecting a 286 Computer to the internet via a serial adapter and using IRC chat no less! After that I shall be covering Chromebook’s, a passing fad or here to stay? BMV has generously been loaned one to review and I plan on delving in to this portable computer that has people in a buzz. Why is it some people love them and others can’t stand them? I will shall be spending the next few weeks using a Chromebook instead of my G4 Ibook to see what benefits come from living in the clouds. Be sure to check back here to see the review, which I’m sure is going to be a fun read. Until then, keep on geeking!